Julia Kantor has been writing about health and wellness since 2001. Trained as a clinical scientist, she conducted research and managed trials for cancer, diabetes and other indications for more than 10 years. Her research was published in scientific journals "Annals of Oncology" and "Genes & Development." She holds a Master of Science in biochemistry and biology from the University of California, San Francisco. Consumed for thousands of years in Asia, green tea has become a favorite in the Western world for its mild taste and soothing aroma. This tea is high in antioxidants and full of health benefits. 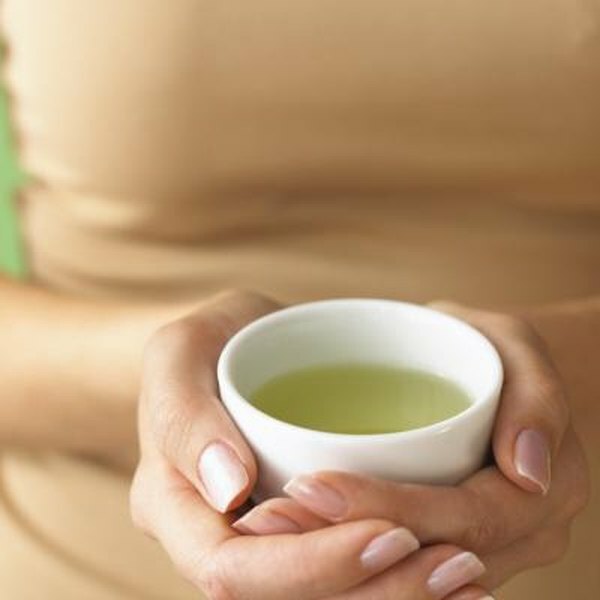 Studies show green tea’s antioxidant properties may help to heal liver injury and prevent future damage. High doses of green tea extract may lead to hepatotoxicity, however, so speak to your doctor prior to starting any green tea supplements. Green tea contains high levels of polyphenolic antioxidants. Among the most powerful are the catechins, a type of phytochemical. These catechins incapacitate free radicals, which can form in the body or be absorbed from external pollution and cause damage to your cellular structures, biochemical processes and DNA. Hepatitis B and C viral infections can compromise liver function and, in some cases, increase risk of liver cancer. The virus can tilt the balance between oxidative damage and antioxidant protection of cells in the liver, causing oxidative stress. Several clinical trials have demonstrated that antioxidant therapy can effectively normalize liver function in hepatitis-infected patients. J. Xu and co-authors reported in the June 2008 issue of "Antiviral Research" that catechins purified from green tea suppressed hepatitis B activity in vitro. Further studies are needed to validate this effect in humans. Nonalcoholic fatty liver disease, or steatosis, results when too much fat accumulates in the liver instead of being transported to other tissues for energy. The condition, more common in obese individuals, can lead to poor hepatic function, oxidative stress and localized inflammation. H. J. Park and co-researchers reported in the April 2011 issue of "Journal of Nutritional Biochemistry" that obese mice supplemented with green tea extract for six weeks were able to improve liver function, as well as reduce oxidative stress and inflammation. These results could potentially translate to humans, but further research is needed to confirm this hypothesis. M. F. Sing and co-researchers performed a systematic analysis of published data relating green tea benefits to cancer prevention. In the March 2011 issue of the "European Journal of Cancer Prevention," they reported that eight studies showed green tea may significantly reduce the risk of primary liver cancer, but cautioned that more studies should be done to explore this possible benefit. In the March 2007 issue of "Chemical Research in Toxicity," J. D. Lambert and co-authors cited rare reports of cases of hepatotoxicity associated with high doses of green tea supplements. The side effects usually resolved once people stopped taking the supplements. If you are thinking of taking green tea supplements, consult your doctor regarding safe dosage.